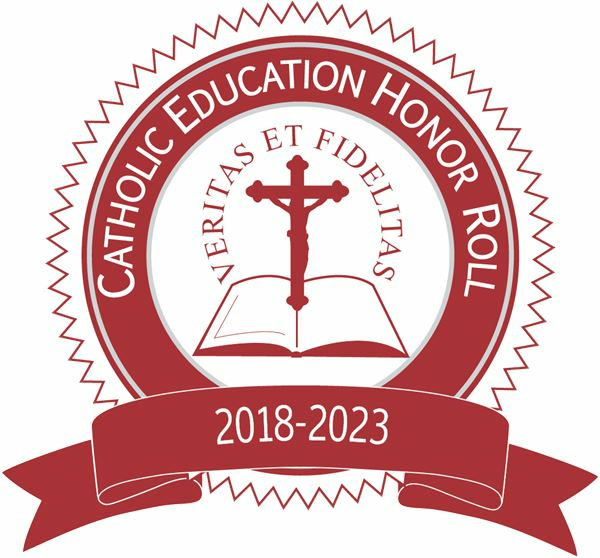 St. Vincent de Paul Catholic Schools has been recognized as a Catholic Education Honor Roll School System. St. Vincent is ranked Top 5% of Catholic Schools in the National Program and is recognized as 1 of the 300 high-performing Catholic high schools nationwide since the program's inception in 2004. Since 2004, St. Vincent High School has been recognized three times and continues to meet the key principles that guide Catholic education. 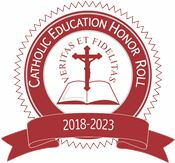 Click the link to read more information about the Catholic Education Honor. 2018-2019 School Theme: JOY - "Jesus First, Others Second, You Last"
Let us open ourselves to be led by the JOY of the Spirit and keep our gaze on God through the 2018-2019 SV school year. Our school Crest was originally designed by the Daughters of Charity, who served our schools along-side the Vincentians for many years. At the top of the crest are the cross and the initials, SV, representing our faith and school. Encircling the SV are three words: Religio, Scientia, Cultura (religion, science and culture). The united wheat strands, representing the Eucharist, coming together to receive Christ as the “Bread of Life” symbolize the merger of all St. Vincent schools. The preschool program is designed to meet the academic and social needs of children 3 and 4 years of age. The activities are designed to make the children feel good about themselves and others as they learn basic school readiness skills. For example, a letter is the focus of activities each week. The children take turns doing jobs such as holding the flag for the pledge of allegiance or take care of a class pet such as a turtle or fish. The children sing songs about days of the week and counting. Puzzles, painting, and craft activities help eye hand coordination and fine motor skills. Gross motor skills get a fun work out on the new playground. Imaginations are challenged with kitchen center, doll house, barn, and dress up clothes. Students are also taught basic school skills such as how to take turns and how to share. Each class time enjoys a healthy snack and juice which is followed by a bit of playtime. "Miss Ann" is the teacher and is a loved icon in the St. Vincent community. She has many years of caring for the little ones in our community. Some of her present parents still harbor a love for her that began when she was their teacher many years ago. For more information, call the Parish at 573-547-4300 ext. 6 or you can send an email to awengert@svdepaul.org but sign up fast because "Miss Ann's" classes fill up fast!